Christmas Lights, Safer, Easier, Mains Free Lighting! Want UK Christmas Lights that Work Longer but don't cost the earth? Welcome to the Next Generation of Powered Led Christmas Lights. Christmas Lights Designed for the UK Outdoors, from PowerBee Endurance ® Outdoor Fairy Lights, to our Saturn Solar Powered Garden and Wall Lights, Add Solar Lights to Your Garden this Xmas time that Work Longer! String Lights Up, Add Entrance and Wall Lights and Leave them on Auto, they will Operate on their Own for Hours during Winter, Safely, No Mains, No Fuss. Choose Solar or Battery Outdoor LED Xmas Lights !!! PowerBee Brand Lights Work Longer than any other Solar Lights in their Price Range, they Work All night Long in Summer, and Many Hours in Winter Time. USB Charging is so Easy to use, simply Unplug the String, then Plug the Base (batteries are inside) in to a USB Port with the Cable provided. 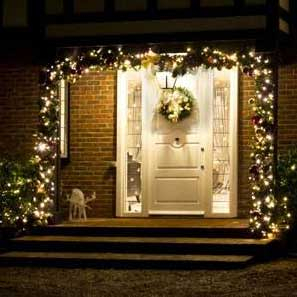 When You Need Fairy Lights on all night long for Christmas, New years Eve Party or BBQ, you can Depend on our Lights to Charge, why not Add some Saturn Garden Lights for Pathways, and Saturn Wall Lights for Entrances. Our Solar Powered Lights are a direct Alternative to mains, they give you a Cost-effective, Practical way to use Lighting in any Garden Space any time of Year. PowerBee Endurance use high efficiency solar cells, for our LED Outdoor Christmas Lights, they Charge the Batteries Faster in Cloudy Conditions. We only use quality materials, our manufacturer is ISO certified that's because we really care about what we do! As a result here at PowerBee Ltd, our solar lights last much longer than anyone else's, whilst offering an unrivalled level of performance. Mains power is now truly unnecessary, allowing you to enjoy a magical holiday like experience in your garden, all year round. If you want to buy a really decent Solar Christmas Lights that work really well, and will last good number of years, then Powerbee range is perfect for you.